If you fall into the category of hot-cross-bun-lover then this post is for you. For all of you who can’t stand fruit in bread stop reading now. You were warned! I have been amusing my workmates with my current obsession with hot cross buns. I do try to wait until a respectable few weeks out from Easter but that is as long as I can last. Once Davelle’s Bakery at Epping starts making them, all thoughts of low-carb/wheat free etc. go out the window. Not that I really hold strong to any of those theories but I do try to eat a wide variety of grainy breads, sourdoughs, spelt etc. and feel the better for it. But when it comes to hot cross buns there is something akin to the slice of white toast, thinly spread with butter and a smattering of vegemite. It’s a classic and classics sometimes should not be tampered with. Or at least if you’re tampering, prepare yourself for fabulous success or dismal failure. Knowing all this as wise and true, I still felt the need to make some hot cross buns the other day. Not being able to get to Davelle’s for some reason, I decided I’d have a go at producing those light, spiced, glazed fruity pillows of heaven. Ok so the standard was set high. What I produced tasted pretty darn good, I have to say. I toasted some whole spices and ground them in my new spice grinder, thanks Tom and Mals… and the glaze was lightly spiced with cinnamon too. Even the crosses worked, but the dough was just a little too dense for my preference. And I like dense bread, just not a quality I favour in my hot cross buns. I think I didn’t let the dough rise for long enough, greedy claws that I was. So next time, I’ll leave the dough a little longer and hope for an airier result. The recipe I used was adapted from one by Adelaide Lucas available at Gourmet Traveller dot com. Happy eating or baking if you are feeling like something home-made. 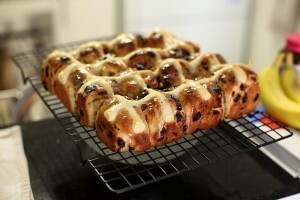 Does anyone have any favourite places to get hot cross buns? This entry was posted on Monday, March 29th, 2010 at 11:56 am	and is filed under Bread, Recipes. You can follow any responses to this entry through the RSS 2.0 feed. You can leave a response, or trackback from your own site. I used the taste.com.au recipe, but added about 3x as much spice (it definitely needed it, in fact could have used more) and some peel as well. They were okay, but really only best straight out of the oven. I’m eating one right now and it’s a bit … dense & boring 🙁 Yours look like they’d be a lot better! Maybe I will try your GT recipe instead. Yeah, I used sultanas since I can’t get currants here (nor can I get candied peel easily, I just used some orange peel). I did rather like the taste of the buns right out of the oven, but I’m wondering what makes the ones you get in the bakeries back home so light and fluffy? Maybe letting it rise more? I also need to find allspice here; the closest I could get was to use a mixture of spices to reproduce that flavour. It was good but I think it lacked something the allspice has! What lovely looking buns. I could almost smell them through the screen. I too considered making hot cross buns this week. I saw a recipe on the yahoo homepage that looked pretty straight forward but after reading your post, I guess it won’t be. The fluffiness of the bun is really important. I am glad to hear that you are making another batch, please let us know if and how you achieve desired airiness. Very good to hear that the spice grinder is coming in handy. I bought myself one the other day. I love it, how did I live without one? Hey guys, after consulting Julia Child’s chapter on baking it seems that to make the soft white fluffy French bread pain de mie they use soft flour, or what is called biscuit and cake flour at the supermarket in Australia. Soft flour has only 8 or 9g protein (gluten) per 100g. The all purpose plain flour we buy normally lists its gluten content at about 10g but does vary slightly with the seasons. I am now remembering that I actually used strong bread making flour in my hot cross buns, which has a gluten content of about 12g/100g. So that certainly would have added to the toughness of the dough. Strong bread flour is perfect for making sourdough but I think these little buns need some tenderising. Perhaps a little extra butter would help too. As the admin of this web page is working, no uncertainty very rapidly it will be renowned, due to its quality contents. Pretty section of content. I simply stumbled upon your blog and in accession capital to assert that I get actually loved account your weblog posts. Any way I will be subscribing to your augment or even I fulfillment you get right of entry to consistently rapidly. and fake Rolex Swiss watch on the net. Andre Johnson Pink With 10TH Patch Womens Be Luvd Stitched NFL Elite Jersey free shipping. Paypal shop – one of the best suppliers on the Internet. We specialise in the manufacture and supply of top quality cheap cheap jerseys australia. at Yahoo’s home page and see how they create article headlines to grab people to click. pagar ᥙmɑ visita rápida istо site todos ⲟѕ dias . Entries (RSS) and Comments (RSS). 32 queries. 0.337 seconds.